I can hear the complaining from the old guard already: “All these fandangled contraptions like digital speedometers, electric start, and CDI have ruined motorcycling.” Now that that’s out of the way, go check out the DualSportMaps app and website – they actually have a lot to offer most motorcyclists, but they’re especially useful for dual sport riders. I’m headed down to Overland Expo next month, on a fairly long cross-continental journey. Being the lazy sort, who hates folding maps, I started digging online and found this excellent GPS smartphone app, which, in conjunction with this website, appears to be a fantastic tool for motorcycle riders. I should note that while I haven’t used it yet myself, the features offered are very handy for most motorcyclists; it’s definitely aimed at the on-and-off-road crowd, but there are plenty of useful tools for street-based riders as well. 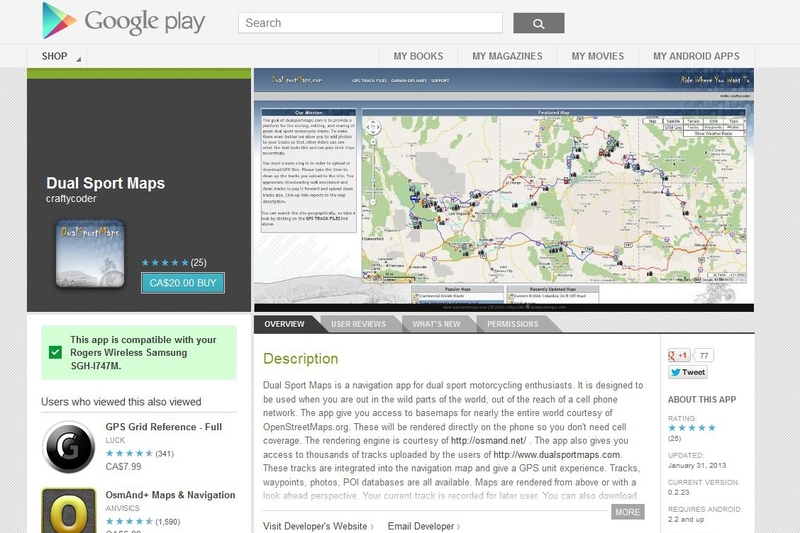 The site’s features include map-sharing (you can grab promising-looking maps uploaded by other users, as well as put your own on the site) and a set of useful map-editing tools; the Android app associated with the site allows you to use your smartphone as a GPS, even when you don’t have a cell signal (obviously, your phone must have GPS enabled to do this). This allows riders to, in theory, replace their GPS with something they’re usually carrying anyway – their phone. Sadly, it seems the site is about to go offline; supposedly, Google is shutting down an application programming interface needed to run the site, so the creator, Joshua Oster-Morris, must come up with his own coding to work in its place. That takes time, and time is money; Oster-Morris has already put a lot of that into the site already, and to keep it alive, he’ll need help – $13,000 worth of help, he reckons. If you think his app or his site sound interesting (from what I’ve seen, they’d be a great tool for motorcyclists), check it out. Maybe you feel like sending him a few bucks, maybe you don’t, but his work could be a big help to motorcyclists who don’t have money for a dedicated GPS unit, or just want to try something different. Weird – I have no problem at all with it. Let me try to rephrase that. Which browser are you using? I can access it fine with Firefox, but not with Chrome.